Description: "Mother and calf" duo, #501 & 511, sit next to another BRC unit in an unidentified Chicago yard. 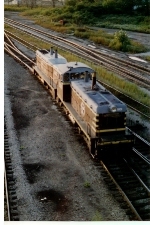 Both mother and calf were built by EMD in December of 1949. Description: I believe these were taken from the Cicero Ave Bridge. Description: A BRC cow-calf set approaches Foerst hill tower from Clearing with a trainsfer. Note the signal beyond the train has not dropped to stop. The signals here were not automatic. Description: A BRC cow-calf set works east through Forest Hill interlocking.